Summer is here and it’s awesome. I’m ready for long days filled with not much of anything to do, grilled dinners, and some serious sitting-in-the sun-while-reading-a-book time. This also means finding fun ways to keep the tot fed as well as cool. If things are healthy, even better. This is a simple recipe perfect for a hot summer day. 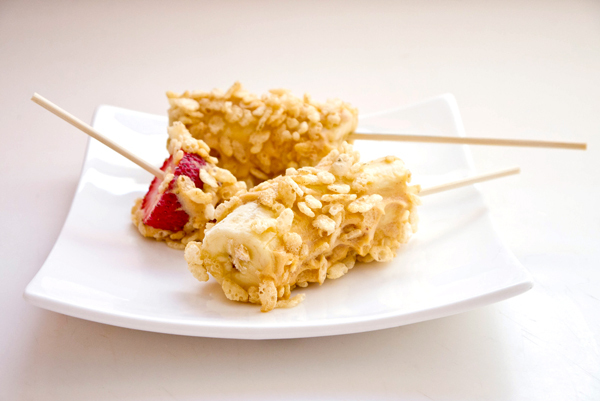 These frozen banana treats can be tossed together in the morning, left in the freezer to chill for a couple of hours, making them ready for cool summer eating by the afternoon. Bananas are a high in potassium, which gives your child’s busy body a cardiovascular boost as well as help in building strong bones. Yogurt is full of probiotics, creating happy tummies. And peanut butter offers a nice protein kick, keeping kids full of fuel. This is such as easy recipe, which makes it perfect for kids to make all on their own. Keep things safe by trimming the pointed ends from the wooden skewers and then cutting in half before getting started. Measure and add the yogurt and peanut butter to a bowl and whisk together. Once things are smooth, add the powdered sugar and stir. Go ahead and pour the puffed rice cereal onto a plate. Peel the bananas and then cut in half. Place a square of aluminum foil under the bananas, which makes cleanup easier. Use a butter knife to coat the outsides of the bananas. Along with being fun, slathering that peanut-yogurt mixture on those bananas hones fine-motor skills and takes concentration. Gently roll the bananas in the puffed rice. Once coated, spear with a skewer and pop in the freezer for at least 2-hours. I think you could coat just about anything with this tasty peanut butter yogurt frosting, roll it in puffed rice, and it would be good. We tried strawberries – but you could also experiment with apple or pear slices, chunks of pineapple, or even grapes!